One of the most common complaints from new puppy owners is, “How do I get my puppy to stop biting my hands and arms and chewing on my pant legs?” Okay, before we address the problem let’s recognize that this is a perfectly normal activity of puppies who, like little babies, have a craving to explore and play with their new world. Unlike babies, they don’t have hands so they use their mouths. Yes they will grow out of this annoying habit but it will be roughly their fifth to sixth month when their permanent teeth have replaced those razor sharp little needles. Plus we have to remember that during the latter stage their mouths are itchy because the new teeth are coming in and thus an increased craving to gnaw and chew. First rule when dealing with this challenge is “Remove the problem from the dog or the dog from the problem”. Tattoo this on the fridge door because it’s the basis for solving many dog problems. Obviously it’s not realistic to remove the dog from the problem unless he’s crated or tethered, so let’s remove the problem from the dog. Starting immediately, stand up straight and keep your hands away from the dog until he settles down and lets the air out of his tires. While you’re at it, no more waving your hands about and talking baby talk. 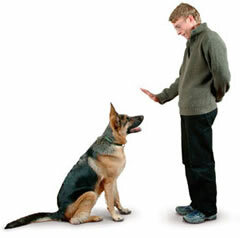 All you’re doing is stimulating the dog and encouraging him to jump up and grab at your hands. Only after he’s settled do we reach down and pet him under the chin so we don’t encourage him to jump up for attention. Same thing goes for the jeans that come down to junior’s crotch and have six inches of pant leg flopping along the floor. Here’s your chance to make a few new rules in the house. If the dog doesn’t have an opportunity to bite your hands and clothes he will change. Next get some chewy play toys. Tie a light cord around a piece of old towel or old shoe and tease the dog and have him chase the toy around the yard. No he won’t learn to chew your socks or shoes because you’re going to pick them up where the dog can’t get them, aren’t you. Remember the part about removing the problem from the dog. If you don’t want the dog chewing on you, provide an alternative. This isn’t rocket science. Enthusiastic youngsters need something to keep them occupied, they’re not robots that you turn off and pull the batteries. Filling the yard with toys doesn’t cut it. It’s your job as a responsible pet parent to do a good job and this includes being involved. If you don’t want to make the effort, don’t get a puppy. Go to your nearest animal shelter and chose an adult dog. You’ll both be happier. Okay now we know what you should do. What about what you shouldn’t do. Do Not encourage mouthy behavior/Do Not smack your dog for biting. Do Not jam your finger down the dog’s throat/Do Not “alpha roll” or scruff shake your dog for biting/Do Not lose your temper. Dogs are social animals and they have a very strong need to interact with us. Have a plan and follow it. Redirect the dog with toys, tugs, or even ice cubes. Provide lots of physical and mental exercise. Employ regular one on one activity. Remember a tired puppy is a good puppy. Love her and enjoy her.